There are people, though, that I feel sympathy for. These are folks who are uncertain of whether remote viewing is real. Seeing successful remote viewing sessions helps give them some reassurance that there really is something to this phenomenon. It’s not absolute proof, but it adds to their stock of evidence and, hence, confidence. And there is one other set of people that deserve support. These are folks who are trying to defend remote viewing against family or friends who don’t believe in it. Having evidence to show won’t convince the doubters. But it does have the value of making the doubters experience some doubt of their own. And that can be helpful. So for those reasons, I’ve decided to present occasionally one or another set of good remote viewing results that I come across or remember from my extensive archives. Yes, yes, I know—the lazy ones and the ones who just want to be entertained will get some gratification from this. And that’s okay, so long as it also helps those who really need these kind of resources. The first of these session results I’m re-purposing from elsewhere on one of my sites. It hasn’t been widely seen before, and I’ve edited it somewhat from how it’s posted elsewhere. Starting in March of 1986, a remote viewer in what was then called the Sun Streak Program (now, of course, called by the overall name of “Star Gate Program”) was tasked to remote view the warhead of a Soviet intercontinental ballistic missile. As required by protocol, the viewer was fully blind to the target and goals of the remote viewing mission. (In other words, the viewer was told absolutely nothing about the target—not that it was warhead, not that it was Soviet, not even that it had to do with an object, military or otherwise. I can certify this, since I (Paul) was the viewer.) The only cuing information the viewer received was the arbitrary number 184901 317289. There were four remote viewing sessions done against this target. All the information produced by the viewer was either neutral or consistent with what the intended target was. In the interest of space I have selected the key results to display here. 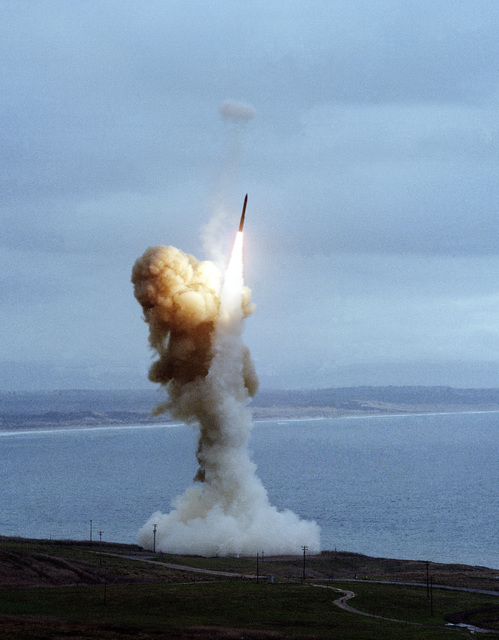 The warhead, it turned out, was what is known as a “MIRV”—short for “multiple independently targetable reentry vehicle.” In other words, it was a missile nose cone containing several individual warheads inside that could each be programmed to destroy a different city or military complex in whatever country it might be fired at. Here are some photos of MIRVs. I could not find any photos of Soviet/Russian ones, so depicted here are US equivalents. Photos of various examples of US MIRV missile warheads. And here are samples of the sketches produced in the four sessions, compared to these similar MIRV warheads (remember, these sketches were produced under fully blind conditions; the only information the remote viewer came from his own mental perceptions obtained through the remote viewing process). Sketch made early in the project compared to an older US Minuteman MIRV. Conceptual sketch of how the “bus”–the rotating mechanism that ejects the individual warheads–fits into the ICBM missile nosecone. The photo on the right shows the warhead being assembled. Here is a conceptual cross-section sketch capturing the remote viewer’s impressions of how smaller warheads nested inside. The photo on the right shows a more modern MIRV warhead from the ironically-named “Peacekeeper” missile (which has since been retired as part of START negotiations).